Lily Pad Quilting: Jacob's Ladder blocks - a Fat Quarter Shop hop! If you've hopped over here from the Jolly Jabber, glad to have you here! Hope you enjoy your visit! 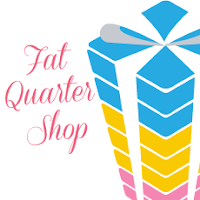 The Fat Quarter Shop asked us to participate in this blog hop, and boy, were we happy! 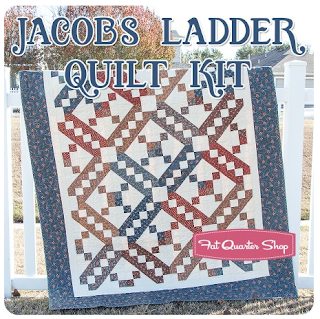 The Jacob's Ladder block is one of our favorites! And Kimberly made this awesome video tutorial, too! Be sure to get those seams nested, and you'll have the cutest four-patches around! Then the whole block goes together like lightning! Mr. Snoodles had requested a new cover for the tv table . . . looking at those autumn colors all year round WAS getting a little monotonous! So I am putting together blocks in spring and summer colors. The reverse will be Christmas colors! (Grin) So then I can just flip it over for the holidays! Got a few more blocks to go, and then I'll start on the flip side! 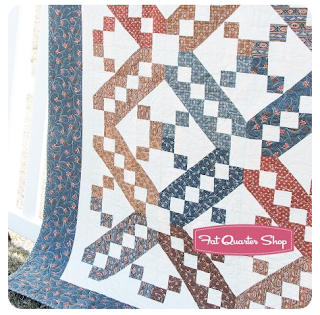 In the meantime, hop back over to the Jolly Jabber blog and check out the other quilters in this hop! I'm so glad you stopped by -- drop by anytime! That looks like a fun block to make. I love the secondary patterns it makes. I love the happy colors you chose! It looks so beautiful! Beautiful blocks. Love your fabric selection. Super design with the 4 blocks together, and would be a really fun quilt.